One of the leaders of the "red-shirt" protest movement in Thailand has promised to continue a clandestine campaign against the government. Jakrapob Penkair managed to escape overseas after the army broke up the mass protests in Bangkok a week ago. Speaking to the BBC from in hiding, he said the movement would use different tactics to confront the government, including possible armed attacks. The protesters say the government is illegitimate, and want fresh elections. The sudden collapse of the red-shirt protests last week has left the movement in disarray. Five of the organisers have been arrested and are being held under the emergency decree, which is still in effect. The police have issued arrest warrants for another 48. However one of its most outspoken leaders, Jakrapob Penkair, has managed to flee the country. Speaking by phone from an undisclosed location, he told the BBC that the struggle to bring down the current government would continue, but that they would no longer rely on conventional forms of protest. "The state of emergency is a big help. It puts people underground. "I believe the room for unarmed and non-violent means to resolve Thailand's problem is getting smaller every day," he said. 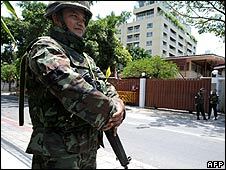 There have been sporadic attempts to blockade roads and public buildings in the north of Thailand - a stronghold of the red-shirt movement - but little other activity since the protesters were surrounded by troops and forced to disperse last week. Radio and television channels sympathetic to the movement have been shut down, and coverage by other Thai media has been largely negative following the violent clashes in Bangkok. There is still strong mass support for the movement's goal of a new constitution and the rehabilitation of former Prime Minister Thaksin Shinawatra in parts of the country. But it is not clear how that now can be translated into an effective challenge to the government.